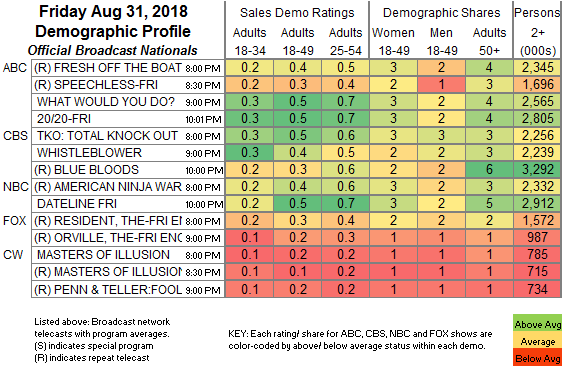 NETWORK FINALS: The AMERICAN NINJA WARRIOR and MASTERS OF ILLUSION reruns lost 0.1 in final numbers. CABLE HIGHLIGHTS: ESPN’s US OPEN coverage led Friday cable at 0.45, and the same network’s COLLEGE FOOTBALL game was next at 0.41. 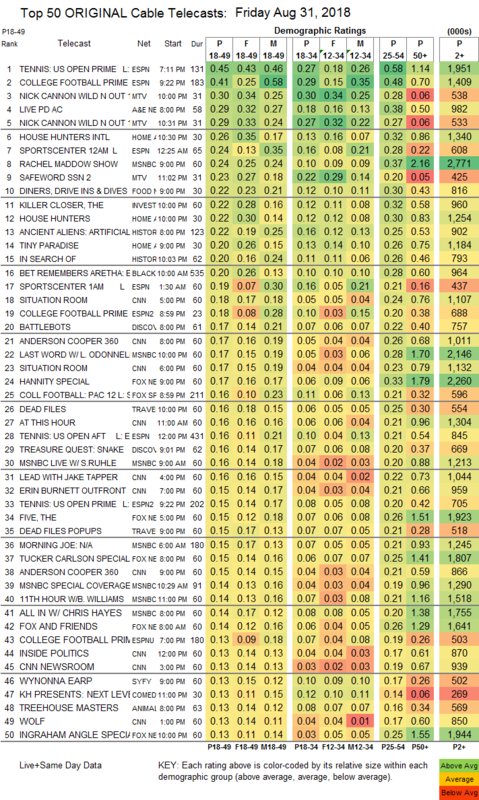 On MTV, WILD N OUT was at 0.30/0.29, compared to last week’s 0.39/0.34, and SAFEWORD ticked down to 0.23. A&E’s main LIVE PD was a rerun, but the clip show was at 0.29. On HGTV, HOUSE HUNTERS INTL gained 0.06 to 0.26, HOUSE HUNTERS was at 0.22, and TINY PARADISE was up 0.02 to 0.20. MSNBC’s RACHEL MADDOW SHOW led cable news at 0.24/0.37/2.8M, , with CNN’s SITUATION ROOM at 0.18/0.24/1.1M, and Fox News’s HANNITY at 0.17/0.33/2.3M. Food Network’s DINERS, DRIVE-INS & DIVES slipped 0.02 to 0.22. On ID, KILLER CLOSER ticked up to 0.22. On History, ANCIENT ALIENS rose 0.02 to 0.22, and IN SEARCH OF was up 0.02 to 0.20. Discovery’s BATTLEBOTS was down 0.02 to 0.17, and TREASURE QUEST ticked up to 0.16. On Syfy, WYNONNA EARP climbed 0.02 to 0.13, and KILLJOYS was up a tick to 0.09. On HBO, ANIMALS rose 0.02 to 0.07, and RANDOM ACTS OF FLYNESS was up 0.03 to 0.07.